I enjoy nothing more than spending quality time with my loved ones, young and old, friends and family, in the weekend. What I have done this weekend? Food pairing at home with my mom. Connie Fong, who is a tea master, was sweet enough to bring me pretty and tasty dessert yesterday for a good afternoon break. She bought three “Cup Cakes” from Sweet A La Mode. Located in Toronto’s west end, Sweet A La Mode is a new café invested and managed by famous Chef Donald Duong. Born in Vietnam, now living in Toronto, Chef Duong won the top Gold Medal at the prestigious Culinary Olympics in 2004. His name has became well known since the 1990’s. There’s no doubt that he made cakes for the Queen, the Pope, the Prime Minister and other dignitaries! The colorful “Cup Cakes” I received from the tea master as gifts were not the ordinary cupcakes that were baked in small thin paper or aluminium cups. In fact each cake was held in a mug-shape chocolate shell in style. Those cakes were well-designed not only for the enjoyment of the mouth, but also for the eyes. I regarded them as art pieces. My mom and I were excited to begin our food tasting & pairing mission immediately! So we quickly took the Ecila Sake Chocolates out to match with the Sweet A La Mode “art cakes”. The pink Grapefruit Mousse Cup Cake matched extremely well with Ecila’s heart shape “Sake Ganache with Dried Fruit” piece. As the cake had a hint of sour taste, it combined well with the sake flavour in a balanced way. 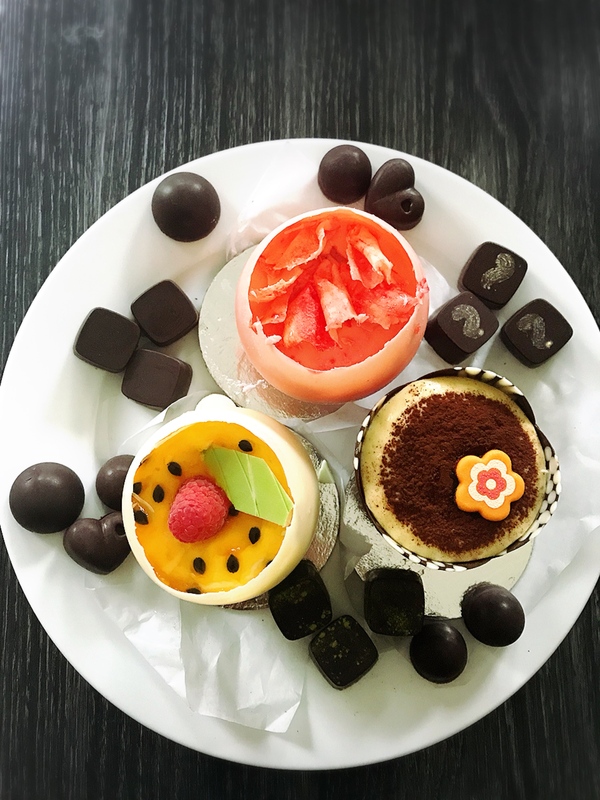 Magic happened when I ate to the bottom of the cake, the soft texture of the remaining grape solids blending with the dried apricot pieces from the sake chocolate made my palate full of fruity freshness! “Happy marriage” went to the “Passion Fruit Mousse Cup” cake and Ecila’s Sake-kasu Chocolate Matcha flavour. The cake contained lemon and lime flavours. I liked the sourness in the cake; whereas if you are not a big fan of sour cake, you might consider eating the cake together with Ecila’s sake-kasu “Matcha” chocolate piece, as the green tea flavour reduced the level of acidity in the cake, and it gave you the extra smooth & creamy mouthfeel. Try it! You would love this amazing effect! Food matching was full of surprises and fun. Before pairing Ecila’s Sake-kasu Chocolate Soy Milk Flavour with “Tiramisu Cup” cake, I hesitated if “soy milk” and “tiramisu” would clash. Indeed, the flavours perfectly complemented each other! Two foods helped increase the intensity of their original flavours. East-Meets-West, “soy milk meets tiramisu”, was truly a happy together. P.S. Ecila Sake Chocolates are my own creations. I invented new recipes to develop “sake chocolate” and “sake-kasu chocolate”.